My brother is the nomad of the family. He’s lived in Salt Lake City, London, Ohio and myriad cities in the Middle East, just to name a few. Recently, he fell victim to the death of paper journalism and was hit in a round of layoffs at a newspaper in Florida. He quickly began to freelance (which was aligned with the unfortunate events of the Trayvon Martin case just a few miles from Orlando) in hopes of eventually writing longer pieces for The New Yorker and other fancy rags. Amidst a flurry of writing, he submitted an application to the Phnom Penh Post in Cambodia. A few months later he was packing up, selling his car and moving to Cambodia. Sure, why not. When he’s abroad, conversations with my brother (thank you, Skype) often involve food. In Cairo I heard about the falafel cart by his apartment, in Jordan it was the tea. Ironically, even though he’s in Cambodia, he hasn’t eaten much Cambodian food. Because there is such a large Vietnamese population, he’s enjoyed enough pho to last a lifetime. Regardless, when I drove past Khmer Kitchen on 6th and Morris a few weeks ago, I was excited to share a gastronomical experience with my brother across the globe. I pulled over, grabbed a menu and impatiently waited for him on Skype. I then proceeded to read much of the menu to him as he could bear (while holding it up to the camera too, of course.) 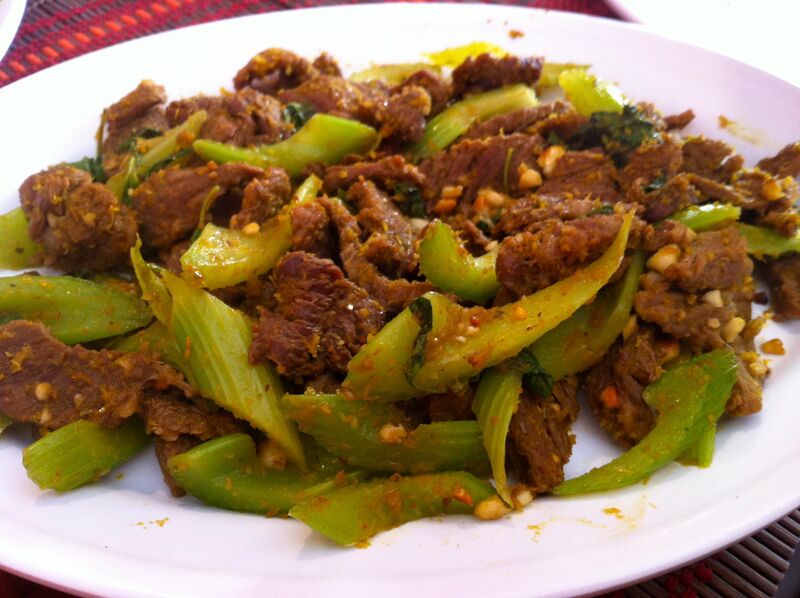 He pointed out lok-lak, sauteed meat over lettuce tomatoes and onions with lime sauce, as a popular Cambodian dish. Then he asked if any dishes had prah-hok in them. I scanned the menu, finding prah-hok kahteeh under the “Traditional Khmer Dish” section. He proceeded to describe the dish as little fish being fermented in large buckets. It sounded disgusting…but also kind of intriguing. 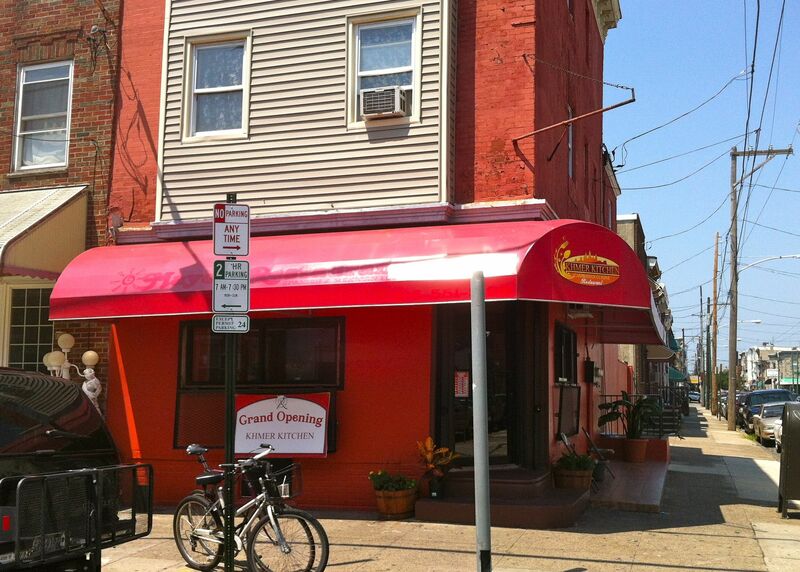 The following week, my husband had off from work on a weekday and we decided to check out Khmer Kitchen. We were joined by my father and his friend–Dad was delighted to go to a Cambodian restaurant as he and my mother will be visiting my brother in November. We walked into the colorful store and sat down. There are about eight tables, two or three of which were filled. The waiter walked over to our table and immediately told us “the only appetizer we have is the meatballs.” Um, ok. Guess we won’t be getting the grilled meat skewers or spring rolls. Boo. The meatballs were priced at $1.50 so I asked if that was per meatball. He responded affirmatively so I ordered one for each of us, with the exception of my father who eschews pork. We also got the bok la-haong (papaya salad) so there was something for Dad. The salad came out quickly. 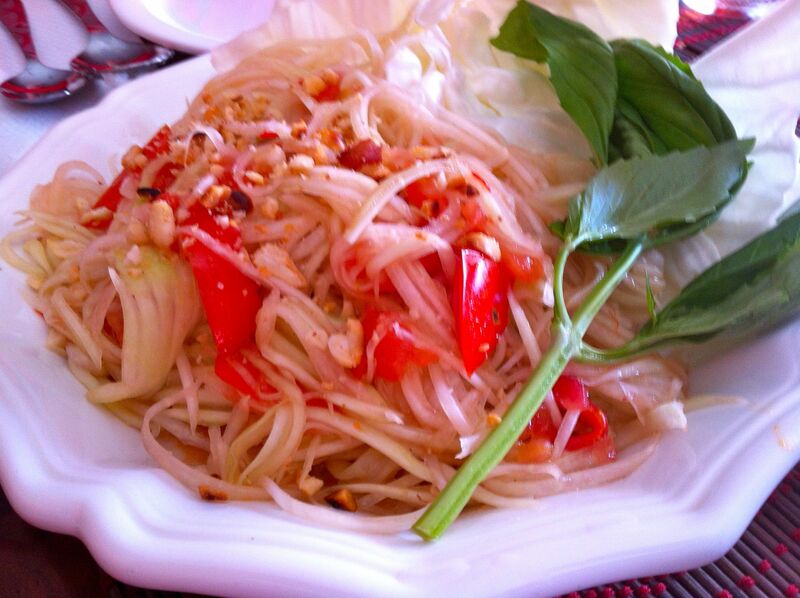 Papaya salad is a staple in many Asian cuisines and this one wasn’t earth-shatteringly different than others I’ve had. Fresh and cool with a bit of a kick for the hot, summer day. The meatballs arrived next. 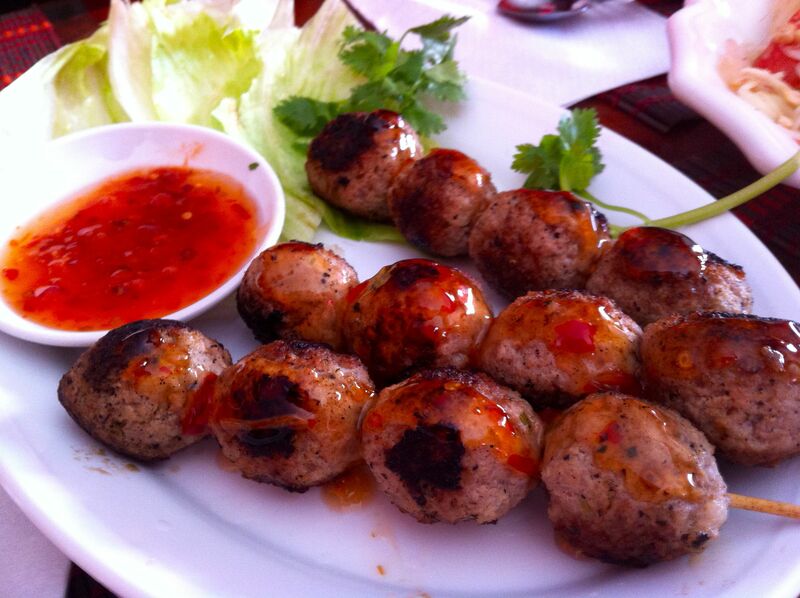 For $1.50 per skewer, we actually got four hearty pork meatballs with a mild chili dipping sauce. The ordering of the entrees was a complicated affair. My father, husband and father’s friend planned on ordering the same thing (two with beef, one with chicken,) but the waiter convinced us that the portions were “very, very big” and another gentleman walked by to let us know that “Cambodian food is meant for sharing.” We ended up deciding on the same dish–one of chicken, one of beef; fried calamari and the pra-hok that I was just dying to try. It was a confusing interaction and I was intrigued to see what we would actually end up with. Khmer Kitchen seems to be a family affair, with the older parents cooking in the kitchen, younger folks waiting tables and youngest children hanging out, playing games behind the counter. The dishes are all cooked to order which can mean hurry up and wait. Finally, the first dish came out. Whoops, miscommunication. We got two of the sauteed beef with celery and peppers. The dish was simple yet tasty. The tender beef had a bit of heat and a slight curry flavor. I don’t know that I would order two of the exact same dish next time, but it was certainly a solid option. Next up was my pra-hok. Yes! 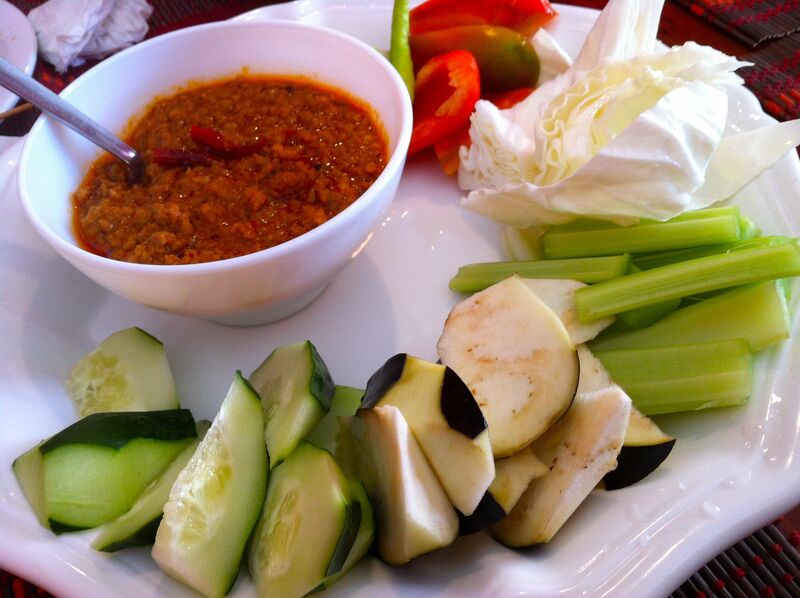 The waiter told me that I could pick up the veggies and spoon a little pra-hok on them all fancy “like caviar” or I could do it “like we do it” and load a bunch of veggies together with a huge dollop of the ground pork. I think I hit those two somewhere in between. When I initially ordered the pra-hok, the waiter perked up, mentioning that it was a Cambodian special. The dish did not fail to delight. It was smooth and creamy with just a hint of coconut and little heat. The vegetables were a great vehicle for the pork, letting the protein shine. My favorite veg for this purpose was probably the cabbage as it has little flavor and perfectly encapsulated the meat. This is a great dish for sharing and no need to be scared of the fermented fish. There was no fish flavor to be found. I’m not sure if I was happy or sad about that one. Next came the fried calamari. The calamari wasn’t heavily breaded and was surprisingly tender. 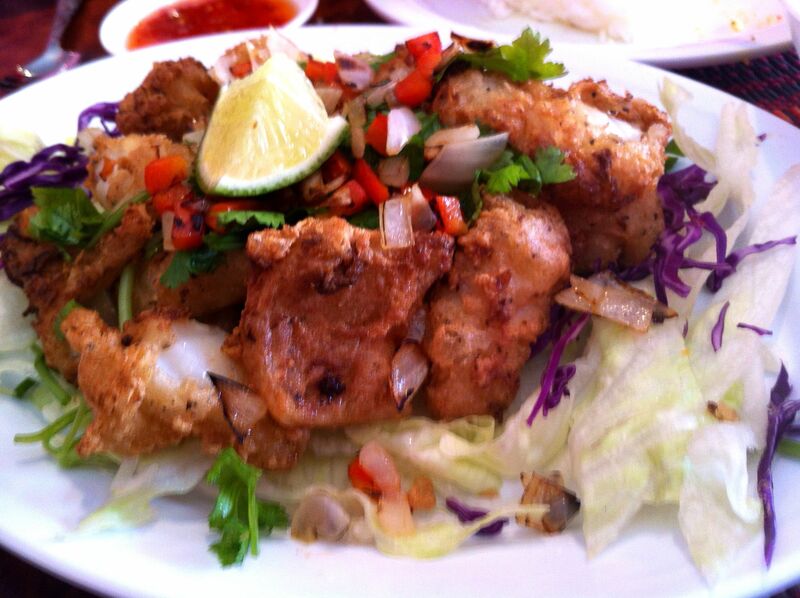 It was reminiscent of salt and pepper squid that you might find at a Vietnamese restaurant. We waited and waited some more and finally out came the chicken saute. Nope, not the chicken saute. I think it was the Sah-Law Kah-Rhee Mohn, a curry chicken dish also listed in the “Traditional Khmer Dish” section. The waiter did, at some point, suggest that dish but none of us quite remembered ordering it. Oh wells. 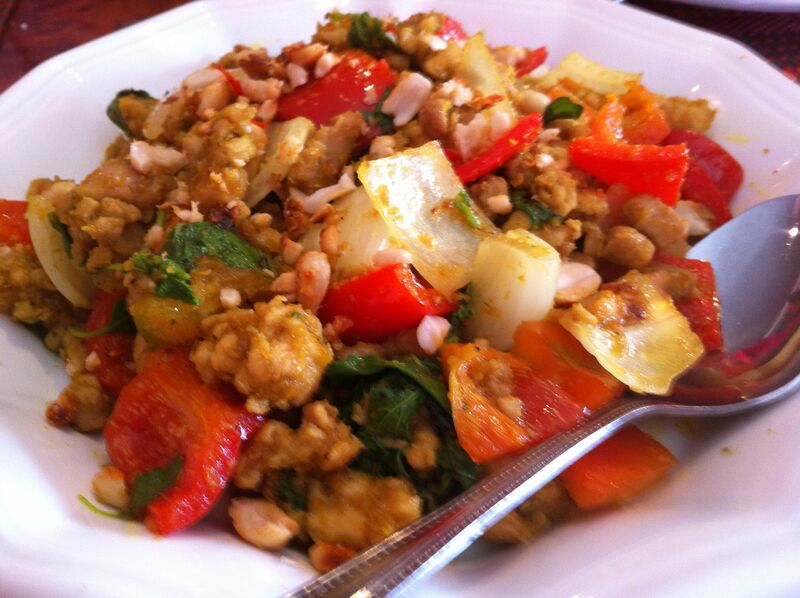 It was a nice change with lots of veggies, peanuts and a not-too-overwhelming curry flavor. This feast was a whopping $55 for four people, an incredible deal given the amount of food we ate (and leftovers we went home with.) The service is slow, yet friendly and they pour bottled water to everyone. I will certainly be making a return trip or two and hope their appetizer menu expands on my next visit. Had the delightful experience of getting to smell the neighbor’s homemade pra-hok being fermented/brewed on a recent trip to Phnom Penh. Needless to say it’s much better enjoyed through the mouth rather than the nose.